The new system is available now, first on PS4. A new camo progression system is now available in Call of Duty: Black Ops 4’s battle royale mode, Blackout. 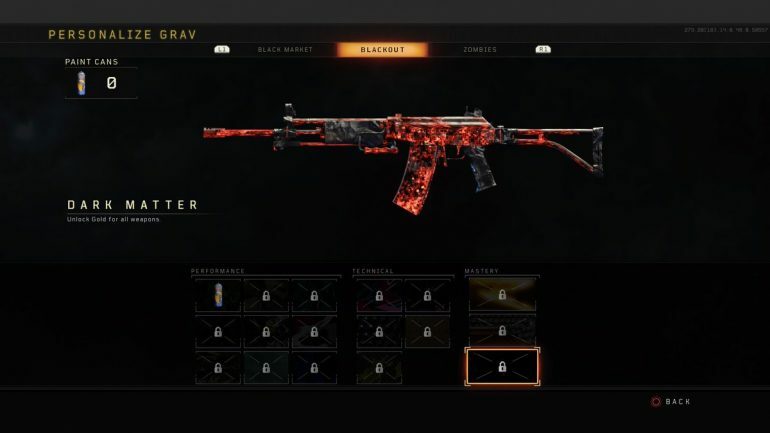 Treyarch made a Reddit post detailing the new camo system in Blackout, which is only live on PlayStation 4 at this time. The system introduces a new in-game item to Blackout: Paint Cans. Players need to collect Paint Cans and use them toward unlocking camos for each individual gun in Blackout. “This new mechanic is uniquely designed to reward players for exploration, looting, and survival in Blackout, without having to complete headshot challenges on every weapon,” Treyarch said. Players will keep any Paint Cans that they collect in a game even after they die. “Because the open world of Blackout is so mechanically different from Multiplayer and Zombies, we wanted this system to incentivize exploration during the cat-and-mouse game of battle royale,” Treyarch said. This new progression system is completely different from the one in multiplayer, though—so any player who unlocked Gold, Diamond, and Dark Matter in multiplayer will have to do it all over again in Blackout. If you want to get these rare camos in Call of Duty’s battle royale mode, get out there and start collecting Paint Cans.